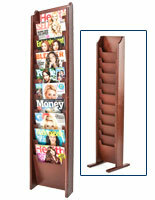 This wooden booklet stand holds a leaflet collection with (10) slanted pockets designed so titles are readily visible. 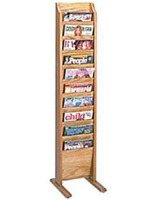 Some magazine racks are mounted on countertops, but these pamphlet holders are best placed on the floor in a prominent area of an area with lots of foot traffic. 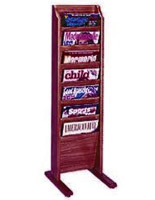 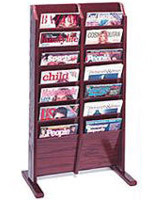 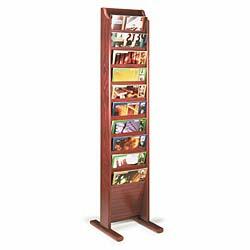 This wooden booklet stand, also known as literature displays, has an eye-catching red mahogany finish. 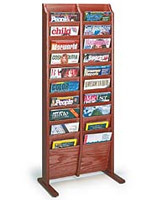 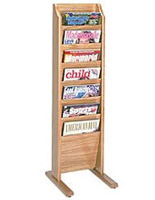 Each of these wooden booklet stands for pamphlets and newsletters are best placed in a hotel or hospital lobby, office waiting room, or retail store. Connect the included feet to the rack with a simple screw driver in minutes!